Hot glue is a fabulous material that can be used to make quick and uncomplicated spider webs. These webs will add a touch of the gothic to Halloween decorations and can be combined with candles and pumpkins to create a buffet centerpiece. 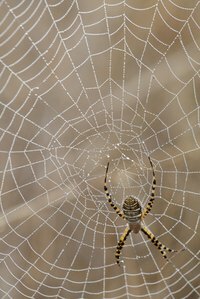 Children will be fascinated with the process of making these spider webs and can assist in the completed web peeling process. Hot glue can cause burns, however, so an adult should be placed in charge of the hot glue gun. Plug in the hot glue gun and let the glue heat up. Squeeze the glue gun trigger and slowly draw a 4-inch line on the cutting board with the glue. Draw an intersecting 4-inch line of glue to create a cross shape. Draw two 4-inch lines through the center of the crossed lines, ensuring that they are evenly spaced. Draw three downward-curved lines between all of the straight lines to make the spider web. Let the glue dry for 10 minutes before peeling the completed web from the cutting board.